Seha, who was established in 1988, besides the activities of trade and production, is performing strategical partnership in Turkey with many companies that operate on different production sectors all over the world. SEHA, through each of its departments’ supreme knowledge, is the primary supplier of many public corporations, world’s leading national and international corporations and many corporate customers. Its purpose is; in a wide spectrum of products, offering optimum solutions to the customers, devoted to their needs. Besides, by completing projects successfully which are aided by national public institutions and international corporations like European Union, World Bank and United Nations, Seha has proven its reliability and power on supply management. SEHA has a knowledge-based, experience-oriented and customer-oriented vision. Seha is a company, that has proven itself with the volume of exportation made to more than 70 countries, with the volume of imports made from more than 25 countries and that has high morality and credibility among more than 20 banks that are worked with. Seha is one of the top 1000 first exporters of Turkey. In performance ranking related to sectors; 74th rank in automotive sector and 5th rank in tyre sector. Seha Tyre Department exports vehicle tires in different sizes under the brand name “SEHA” to many countries in the world. By adding new dimensions to product groups, it strengthens its position in the sector. 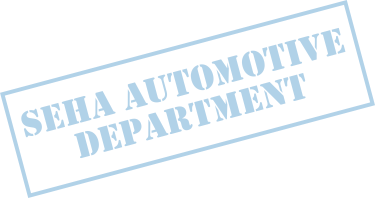 Seha Automotive Department provides services and solutions in a wide range of vehicles with a customer-focused special service vehicle production (Vehicle Superstructure) in the sector. Approved by vehicle manufacturers, Seha is a leading superstructure company in the automotive sector. Seha also carries out business development projects in IT and security areas in its own organisation.